Born in 91 Montpellier Terrace, Cheltenham, Gloucestershire, on 23 July 1872, Wilson was the second son and fifth child of physician Dr Edward Thomas Wilson (1832–1918) and his wife, Mary Agnes, née Whishaw (1841–1930). A clever, sensitive, but boisterous boy, he developed a love of the countryside, natural history and drawing from an early age. He was sent as a boarder to a preparatory school in Clifton, Bristol, but after failing to gain a scholarship to public school, he attended Cheltenham College for Boys as a day pupil. His mother was a poultry breeder and he spent much of his youth at The Crippetts farm, Leckhampton near Cheltenham. By the age of nine he had announced to his parents that he was going to become a naturalist. With encouragement and tuition from his father, he started to draw pictures of the wildlife and fauna in the fields around the farm. After passing his Oxford and Cambridge exams with honours in science, in 1891 he went to Gonville and Caius College, Cambridge where he read Natural Sciences, obtaining a first class degree in 1894. It was during his time there that he developed the deep Christian faith and asceticism by which he lived his life. He studied for his Bachelor of Medicine (M.B.) degree at St George's Hospital Medical School, London and undertook mission work in the slums of Battersea in his spare time. In February 1898, shortly before qualifying as a doctor, Wilson became seriously ill and was diagnosed with pulmonary tuberculosis, contracted during his mission work. During a long convalescence from this illness he spent months in Norway and Switzerland, time he used to practise and develop his skills as an artist. He qualified in medicine in 1900 and the next year was appointed Junior House Surgeon at Cheltenham General Hospital. He married Oriana Souper on 16 July 1901 just three weeks before setting off for the Antarctic as a member of Robert Falcon Scott's Discovery Expedition. In the austral winter of 1911, Wilson led "The Winter Journey", a journey with Henry Robertson Bowers and Apsley Cherry-Garrard, to the Emperor penguin breeding grounds at Cape Crozier to collect eggs for scientific study. The 60-mile journey was made in almost total darkness, with temperatures reaching as low as −70 °F (−57 °C). Frozen and exhausted, they reached their goal only to be stopped by a blizzard during which their tent was ripped away and carried off by the wind, leaving the men trapped in their sleeping bags for a day and a half under a thickening drift of snow. When the winds subsided, by great fortune they found their tent lodged about half a mile away in rocks. Having successfully collected three eggs, and desperately exhausted, they returned to Cape Evans on 1 August 1911, five weeks after setting off. 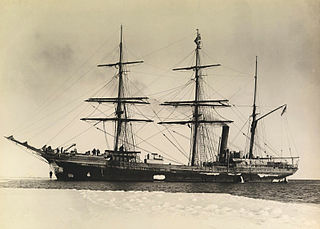 Cherry-Garrard later described this expedition in his memoir, The Worst Journey in the World. Their return journey soon became a desperate affair due to the combination of exhaustion, lack of nutrients in their diet and exceptionally adverse weather. On 17 February, near the base of the Beardmore glacier, Petty Officer Edgar Evans died, suspected to be from a brain injury sustained after a fall into a crevasse two weeks earlier. 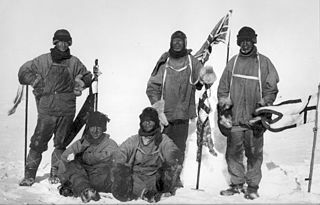 Then, in a vain attempt to save his companions, Captain Lawrence Oates deliberately walked out of their tent to his death on 16 March after his frostbitten feet developed gangrene. 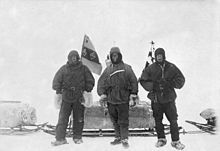 Wilson, Scott and Bowers continued on for 3 more days, progressing 20 more miles, but were stopped by a blizzard on 20 March, 11 miles short of the 'One Ton' food depot that could have saved them. The blizzard continued for days, longer than they had fuel and food for. Too weak, cold and hungry to continue, they died in their tent on or soon after 29 March (Scott's last diary entry), still 148 miles from their base camp. Their bodies were found by a search party the following spring on 12 November 1912. Their tent was collapsed over them by the search party who then buried them where they lay, under a snow cairn, topped by a cross made from a pair of skis. When news of the tragedy reached Britain in February 1913, it created a national mourning. In 1913 he was posthumously awarded the Patron's Medal by the Royal Geographical Society for his work in the Antarctic. At Gonville and Caius College, the college's flag, which Wilson took to the South Pole, is preserved. 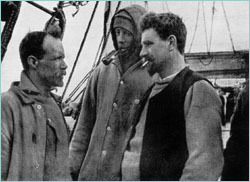 In the film Scott of the Antarctic, Wilson was played by Harold Warrender. In the Central TV production The Last Place on Earth, Wilson was played by Stephen Moore. In the BBC Four production The Worst Journey in the World, Wilson was played by John Arthur. A Royal Geographical Society Patron's Medal (George V issue), in a dark blue case, awarded posthumously to Edward Adrian Wilson for the British Antarctic Expedition 1910-13 (Terra Nova) and presented to Mrs Wilson in 1913. A candlestick made by Edward Adrian Wilson out of a Huntley & Palmer's biscuit tin during the British Antarctic Expedition 1910-13 (Terra Nova). The journal kept by Wilson during the South Polar journey on the Terra Nova expedition is held in the British Library, along with Captain Scott's diary from the expedition. The Wilson art gallery and museum in Cheltenham, holds a collection of watercolours and drawings made by Wilson, as well as the family papers of Edward Adrian's father, Edward Thomas Wilson, who was instrumental in founding the Camera Club, museum, library, a fever hospital, district nursing organisation, and clean water provision for the town. The RRS Discovery in Dundee, the ship Wilson first travelled to Antarctica on, is preserved as a heritage site, and accessible to visitors. The Dundee Heritage Trust collection also includes a small collection of material including a scrapbook and photographs from the Terra Nova expedition. The Edward Wilson Primary School in Paddington, London is named after him. The students' café at St George's Hospital Medical School is named Eddie Wilson's. One of the houses at Cheltenham College is named Westal, after Wilson's family home on Montpellier Parade, Cheltenham. ^ Williams 2008, p. 17. ^ Williams 2008, pp. 25–26. ^ Williams 2008, pp. 22,26. ^ Williams 2008, p. 24. ^ Williams 2008, p. 26. ^ Williams 2008, pp. 28,30. ^ "Wilson, Edward Adrian (WL891EA)". A Cambridge Alumni Database. University of Cambridge. ^ Williams 2008, pp. 34–35. ^ Williams 2008, pp. 41–48. ^ Williams 2008, pp. 50–51. ^ Williams 2008, pp. 52–56. ^ Williams 2008, pp. 31,58–64. ^ Williams 2008, pp. 69–70. ^ "Museum catalogue – Antarctic Collection – Black Flag". Scott Polar Research Institute. Scott Polar Research Institute, University of Cambridge. Retrieved 26 November 2018. ^ "Museum catalogue – Antarctic Collection – RGS Patron's Medal". Scott Polar Research Institute. Scott Polar Research Institute, University of Cambridge. Retrieved 26 November 2018. ^ "Museum catalogue – Antarctic Collection – Candlestick Holder". Scott Polar Research Institute. Scott Polar Research Institute, University of Cambridge. Retrieved 26 November 2018. ^ "Manuscript Catalogue – Wilson's Sledging Diary". British Library. British Library. Retrieved 26 November 2018. ^ "Antarctic and Wilson Family Collection". The Wilson. The Cheltenham Trust. Retrieved 26 November 2018. ^ "Dundee Heritage Trust Collection". Dundee Heritage Trust. Dundee Heritage Trust. Retrieved 26 November 2018. ^ "Cheltenham's Museum and Art Gallery renamed The Wilson". BBC News. 18 September 2013. Retrieved 18 September 2013. ^ "Biography - The British Birds: 1905-1910". 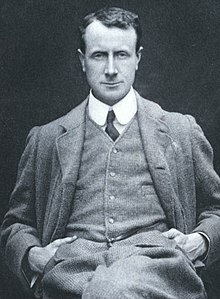 Edward Wilson. Retrieved 5 September 2017. Williams, Isobel (2008). With Scott in the Antarctic : Edward Wilson – explorer, naturalist, artist. Stroud: History Press. ISBN 9780750948791. Sir Charles Seymour Wright, KCB, OBE, MC, nicknamed "Silas" Wright after novelist Silas Hocking, was a Canadian member of Robert Falcon Scott's Antarctic expedition of 1910-1913, the Terra Nova Expedition.